Sweepstakes Scavenger Hunt - Get Motivated! Challenge Yourself to Win More Sweepstakes! Challenge yourself to a sweepstakes scavenger hunt! Do you get bored entering the same sweepstakes? Have you been meaning to shake up your sweepstakes entries by trying something new someday (though someday never seems to come)? This sweepstakes scavenger challenges you to become a better sweeper, to stay motivated to enter, and to win more prizes! Print this worksheet. If you can answer the question with "yes," make a check mark next to it. If you're missing some, don't worry - some questions are easy, and others are very hard so that everyone gets a challenge! Have you ever... Created an email address just for sweepstakes entries? Tip: Learn how and why to set up a sweepstakes email. 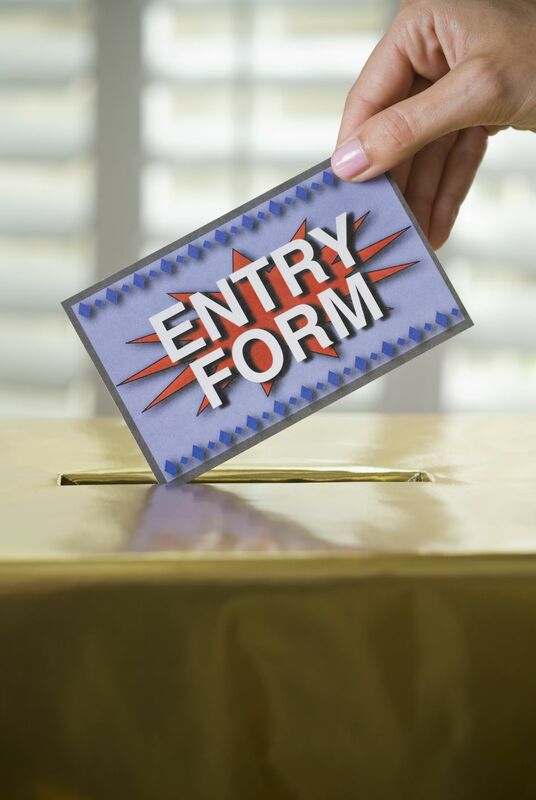 Tip: Get an overview of sweepstakes entry methods. Tip: More about entering sweepstakes by email. Tip: Alternatives to using your home phone when entering sweepstakes. Entered sweepstakes by text message? Tip: How to Enter Text Message Sweepstakes. Tip: Improve your odds of winning radio contests. Tip: How to find contests to enter. Tip: Learn why you should enter contests. Have you ever... Entered photography contests? Tip: Learn how to take prize-winning photographs. Tip: Learn how to create winning recipes. Tip: Tips to Create Contest-Winning Videos. Entered more than 25 sweepstakes on the same day? Entered more than 50 sweepstakes on the same day? Tip: Use Roboform to enter more sweepstakes in the same time. Entered more than 100 sweepstakes on the same day? Tip: Enter sweepstakes in half the time. Entered sweepstakes every day for a week? Tip: How to create a winning sweepstakes strategy. Entered sweepstakes every day for a month? Entered daily sweepstakes every day from start to end of the entry period? Tip: Find the newest sweepstakes to enter. Gotten up early (or stayed up late) just to enter sweepstakes? Turned down an invitation to stay home and enter sweepstakes? Tip: Improve your odds of winning. Won at least 5 prizes? Tip: Discover the best sweepstakes to enter. Won at least 10 prizes? Tip: Use my 20 Best Sweepstakes Tips to win more. Won at least 50 prizes? Tip: The Lots of Prizes List can help you win more often. Needed to return a notarized affidavit to receive a prize? Tip: Learn more about affidavits. Won a prize worth at least $100? Tip: What is an ARV? Won a prize worth at least $500? Tip: Learn the difference between FMV and ARV. Won a prize worth at least $1000? Tip: Is my ARV too high? Won a prize worth at least $10,000? Have you ever... Won more than $1,000 worth of prizes in a single month? Won more than $10,000 worth of prizes in a year? Received a win notice or prize by email? Tip: Learn how winners are usually contacted. Received a win notice or prize by telephone? Tip: How to use call forwarding to never miss a telephone win. Received a win notice or prize by postal mail? Tip: Research win notifications to avoid falling for scams. Received a win notice or prize by courier (UPS, Fed-Ex, etc.)? Tip: Make sure you receive win notifications when you move. Followed up with a sponsor to receive a prize that wasn't shipped? Tip: Instant Win Sweepstakes to enter. Tip: Daily Sweepstakes to enter. Tip: One Entry Sweepstakes to enter. Have you ever... Won radio contests? Tip: Cash Sweepstakes to enter. Won a car, truck, or boat? Tip: Car Sweepstakes to enter. Tip: Sports Sweepstakes to enter. Tip: Vacation Sweepstakes to enter. Won a computer, laptop, or game console? Tip: Electronics Sweepstakes to enter. Won electronics (other than computers and game consoles)? Tip: These prizes are also found under Electronics Sweepstakes. Tip: Jewelry Sweepstakes to enter. Have you ever... Won a grill? Tip: Grills are listed under House and Garden Sweepstakes. Won a party, movie screening, or other group event? Won fashion prizes (t-shirts and caps count)? Tip: Fashion Sweepstakes to enter. Tip: These prizes are found under House and Garden Sweepstakes. Won a pass to a sporting event (NASCAR, baseball, football, etc.)? Tip: These prizes are found under Sports Sweepstakes. Won tickets to another kind of event (a play, the opera, a concert, etc.)? Won the chance to meet a celebrity? Won a room, backyard, or home makeover? Tip: Find these prizes under House and Garden Sweepstakes. Tip: Read about the annual HGTV Dream Home. Have you ever... Won more than once in the same week? Won more than 5 times in the same month? Won an essay contest (non-fiction)? Get some tips on winning writing contests. Won a fiction writing contest? Won more than once from the same sweepstakes (when the rules allowed)? Tip: Learn more about the importance of reading sweepstakes rules. Won more than once from the same sponsor (different sweepstakes)? Had a prize show up at your doorstep without knowing about it first? Have you ever... Sent a thank-you note to a sponsor? Tip: Read more about being a considerate sweeper. Sent a photo to the prize winners' photo album? Tip: Learn how to track sweepstakes wins. Started a scrapbook or memory box of your sweepstakes wins? Tip: How to Create a Sweepstakes Scrapbook. Reported sweepstakes prizes on your taxes? Tip: How to Pay Sweepstakes Taxes. Given a prize as a gift? Tip: How to win prizes to give as gifts. Given a prize to charity? Become friends with someone that you met through sweepstaking? Have you ever... Been to a meeting of a sweepstakes club? Tip: 5 reasons to join a sweepstakes club. Tip: 5 reasons to attend sweepstakes conventions. Entered a friend or family member for the chance to win? Tip: Make sure you understand the sweepstakes entry restrictions before doing this. Received additional sweepstakes entries for referring friends? Tip: Learn how to multiply your chances with sweepstakes referrals. Given someone your email address to use for sweepstakes referrals? Tip: Consider joining the Sweepstakes Referral Exchange on the Sweepstakes Forum to increase your chances while helping others win. Convinced a friend or family member to start entering sweepstakes? Been told by friends and family that "you're so lucky?" Tip: If not, maybe you should see if a luckier attitude might help. Purposely tried to improve your luck? Tip: Try the top ways to improve your luck and see if you become more successful! Have you ever... Read "The Secret" or a similar book? Tip: Read my review of The Secret. Read a book about improving your luck? Tip: If not, Richard Wiseman's The Luck Factor is a good place to start. Tip: Read more about feng shui and luck. Given someone else advice about how to win more? Shared trivia answers, UPC codes, entry blanks, etc.? Tip: If not, the Trivia Answers and UPC Codes section of the Sweepstakes Forum is a good place to start. Helped someone else win by voting in a contest? Tip: If not, check out the Vote Requests section of the Sweepstakes Forum to see who needs some help. Written for or published a sweepstakes newsletter, book, podcast, or website? Been featured in the media (newspaper, tv, etc.) because of sweeping? Felt that sweepstakes have changed your life? I hope that sweepstakes have made a positive change in all of your lives, enabling you to answer this question with a big "YES!" Whew! You're through! Now tally up your answers and see how you did do!